What barriers do these lawyers face and how do they overcome them? A first of its kind research project is hoping to shine a spotlight on the experiences of disabled solicitors and barristers. This research desert makes it difficult to pinpoint the issues most acutely affecting disabled lawyers, hence why Hirst and Foster, unusually, want study participants to set the research’s agenda rather than the researchers themselves. The pair will be running focus groups with disabled lawyers to find out what they want to be explored, with this followed by in-depth one-to-one interviews and later a large-scale survey. The end result, Hirst and Foster hope, will be a report that can influence the policy-making decisions of important legal bodies and their approach to diversity and inclusion. Indeed the research, Legally disabled? The career experiences of disabled people in the legal profession in England & Wales: developing future strategies, already has the support of the Bar Council, the Bar Standards Board, the Law Society and Hogan Lovells. When asked what themes Hirst anticipates will be raised in upcoming focus groups, she suggests the career paths open to disabled lawyers. Though large corporate outfits with huge resources at their disposal may on their face seem more accommodating to disabled lawyers, “there is also a long-hours culture at these firms, where flexible working is an alien concept particularly at the early stages of one’s career,” says Hirst. “This can be very difficult for a physically impaired person to manage.” As for the bar, the physical inaccessibility of courts and chambers can be a crucial factor in one’s decision to pursue practice. Another issue, one that applies to the profession more universally, is the attitude of non-disabled lawyers towards their disabled peers. Legal Cheek discussed this at length with Robert Hunter, a solicitor who is profoundly deaf. He said that while most solicitors don’t consider themselves disablist, subtle prejudices often manifest themselves in “hasty assumptions from non-disabled colleagues about a person’s disability and how this will affect their ability to work”. Because of this, it’s common for disabled lawyers to be sidelined into non-fee earning work (something Hunter is quick to condemn). Interestingly on this, Hirst ponders the role of culture differences between UK and US law firms. Hirst floats the idea that the ‘we don’t care how you do the job as long as you do it’ attitude which is, arguably, more commonly found in US law firms helps with these firms’ treatment of its disabled staff members. “It will be interesting to see if this is raised further in our research,” she concludes. One of the biggest barriers is physical access to firms. While most larger firms are well set up for people in wheelchairs, the reality of many regional firms in period buildings is that they struggle to accommodate potential employees. 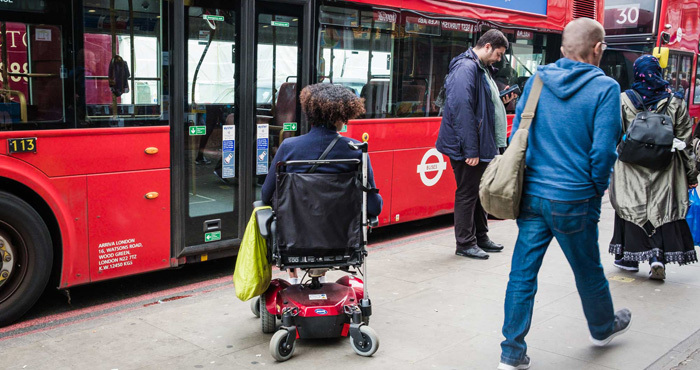 the image used of a backward wheelchair and a person sitting in it is quite frankly, shocking………we are talking about academically accomplished solicitors here…..who chooses your graphics? the title of the article makes little sense too. It’s really too tongue in cheek! I saw details of this on a flyer sent by the Bar Council’s Equality and Diversity committee. It was an invitation to attend “disabled only” focus groups, stating that each of the two researchers “identified as disabled”. It did not state what qualifications, if any, either of the two individuals has. Neither does it summarise their research experience, positions held, etc. I don’t care how someone identifies themself. But I do care about qualifications, experience and objectivity. Cut and pasted from the link…. “Debbie’s original research focus was public sector employment relations and trade unionism. However, she became interested in research on disability and employment following a personal experience of long term ill-health and secured ESRC funding to conduct a project that documented the lived experiences of negotiating workplace ‘reasonable’ adjustments. This has since led to further research projects with trade unions and social partners at the European, national and regional levels. So, two completely objective and unbiassed individuals, well-able to conduct impartial research into a competitive market, thankfully largely devoid of trade unions, which rewards individual contribution based on a combination of cognitive ability, willingness to work long hours and the ability to interact with others. They get funding from the lottery, but it’s based on the DRILL model. The website states that “All projects must be aligned with the Social Model of Disability”. In case you’re interested, that means assuming that disability is caused by the way that society is organised, rather than by a person’s impairment or difference. I am very thankful that hard science and engineering research does not have to be “aligned” with any particular “model”. Particularly whenever I’m a passenger in a car or plane. I’m so excited about this project and research! I think and hope that it will break down some of the barriers, that current and future lawyers encounter. Although the researchers are non-lawyers, they are known in their field for investigating disability issues and employment. Let’s hope that firms and chambers are listening and following this as it will raise your own profile. A disabled lawyer or a lawyer with a disability probably has had to struggle with so much that the skills they acquire during this fight is rarely assessed or considered a strength! Sadly, the Law remains regressive rather than progressive and inclusive! Are long-term mental illness seen as a “disability” by firms? Unfortunately I doubt it. Yes, long-term mental illness should be seen as a disability by firms complying with the Equality Act 2010. I think you are right though, a lot of employers and people experiencing mental health issues don’t think of this as a disability. If it is a well recognised condition that has a substantial impact on your day to day living, then in legal terms it is a disability. I know from experiencing a long term mental illness how disabling it can be. Genuine enthusiasm, or buying appearance?